Blood on the Tracks is the 15th studio album by American singer-songwriter Bob Dylan, released on January 20, 1975 by Columbia Records. The album marked Dylan's return to Columbia Records after a two-album stint with Asylum Records. Dylan commenced recording the album in New York City in September 1974. In December, shortly before Columbia was due to release the record, Dylan abruptly re-recorded much of the material in a studio in Minneapolis. The final album contains five tracks from New York and five from Minneapolis. Blood on the Tracks was initially received with mixed reviews, but has subsequently been acclaimed as one of Dylan's greatest albums by critics and fans. The songs have been linked to tensions in Dylan's personal life, including estrangement from his then-wife Sara. One of their children, Jakob Dylan, has described the songs as "my parents talking". The album has been viewed as an outstanding example of the confessional singer-songwriter's craft, and it has been called "the truest, most honest account of a love affair from tip to stern ever put down on magnetic tape". In interviews, Dylan has denied that the songs on the album are autobiographical. In 2003, the album was ranked No. 16 on Rolling Stone's list of the 500 greatest albums of all time, and in 2004, it was placed at No. 5 on Pitchfork's list of the top 100 albums of the 1970s. The album reached No. 1 on the Billboard 200 charts and No. 4 on the UK Albums Chart. The single "Tangled Up in Blue" peaked at No. 31 on the Billboard Hot 100 singles chart. The album remains one of Dylan's best-selling studio releases, with a double-platinum U.S. certification by the Recording Industry Association of America (RIAA). In 2015, it was inducted into the Grammy Hall of Fame. [Raeben] taught me how to see ... in a way that allowed me to do consciously what I unconsciously felt ... when I started doing it, the first album I made was Blood on the Tracks. Everybody agrees that was pretty different, and what's different about it is there's a code in the lyrics, and also there's no sense of time. Dylan subsequently spent time with Bernstein on his farm in Minnesota and there he completed the 17 songs from which Blood on the Tracks was formed—songs which Heylin has described as "perhaps the finest collection of love songs of the twentieth century, songs filled with the full spectrum of emotions a marriage on the rocks can engender". Prior to recording, Dylan previewed the songs that would constitute Blood on the Tracks for a number of friends in the music world, including David Crosby, Graham Nash, Stephen Stills, Tim Drummond and Peter Rowan. Nash recalled that Stills disliked Dylan's private performance of his new songs; immediately after Dylan left the room, Stills remarked to Nash, "He's a good songwriter ... but he's no musician." Initially, Dylan considered recording Blood on the Tracks with an electric backing group, and contacted Mike Bloomfield who had played lead guitar on Dylan's Highway 61 Revisited album. When the two met, Dylan ran through the songs he was planning to record, but he played them too quickly for Bloomfield to learn. Bloomfield later recalled the experience: "They all began to sound the same to me; they were all in the same key; they were all long. It was one of the strangest experiences of my life. He was sort of pissed off that I didn't pick it up." In the end, Dylan rejected the idea of recording the album with a band, and instead substituted stripped-down acoustic arrangements for all of his songs. On August 2, 1974, Dylan signed a contract with Columbia Records. After releasing his two previous albums, Planet Waves and Before the Flood, on Asylum Records, Dylan decided his new album would benefit from the commercial muscle of the record label that had made him famous, and his new contract gave him increased control over his own masters. Sometimes he will have several bars, and in the next version, he will change his mind about how many bars there should be in between a verse. Or eliminate a verse. Or add a chorus when you don't expect. Eric Weissberg and his band, Deliverance, originally recruited as session men, were rejected after two days of recording because they could not keep up with Dylan's pace. Dylan retained bassist Tony Brown from the band, and soon added organist Paul Griffin (who had also worked on Highway 61 Revisited) and steel guitarist Buddy Cage. After ten days and four sessions with the current lineup, Dylan had finished recording and mixing, and, by November, had cut a test pressing on the album. Columbia began to prepare to release the album before Christmas. Dylan played the test pressing for his brother, David Zimmerman, who persuaded Dylan the album would not sell because the overall sound was too stark. Robert Christgau also heard the early version of the album and called it "a sellout to the memory of Dylan's pre-electric period". At his brother's urging, Dylan agreed to re-record five of the album's songs in Sound 80 in Minneapolis, with backing musicians recruited by David. The new takes were accomplished in two days at the end of December 1974. Blood on the Tracks was released into stores on January 20, 1975. The songs that constitute Blood on the Tracks have been described by many Dylan critics as stemming from his personal turmoil at the time, particularly his estrangement from his then-wife Sara Dylan. One of Bob and Sara Dylan's children, Jakob Dylan, has said, "When I'm listening to Blood On The Tracks, that's about my parents." Dylan has denied this autobiographical interpretation, stating in a 1985 interview with Bill Flanagan, "A lot of people thought that album pertained to me. It didn't pertain to me ... I'm not going to make an album and lean on a marriage relationship." Informed of the album's popularity, Dylan told Mary Travers in a radio interview in April 1975: "A lot of people tell me they enjoy that album. It's hard for me to relate to that. I mean ... people enjoying that type of pain, you know?" Addressing whether the album described his own personal pain, Dylan replied that he didn't write "confessional songs". According to Rolling Stone Magazine, in Dylan's lyric notebook, the working title of Simple Twist of Fate was 4th Street Affair; Dylan and Suze Rotolo lived at 161 W. 4th St. The narrator of the song memorializes an affair of ten years ago instead of singing about Dylan's marriage. In his 2004 memoir, Chronicles, Vol. 1, Dylan stated that the songs have nothing to do with his own personal life, and that they were inspired by the short stories of Anton Chekhov. Released in early 1975, Blood on the Tracks initially received mixed reviews from critics. Rolling Stone published two assessments. The first, by Jonathan Cott, called it "Dylan's magnificent new album". The second reviewer, Jon Landau, wrote that "the record has been made with typical shoddiness." In the NME, Nick Kent described "the accompaniments [as] often so trashy they sound like mere practice takes", while Crawdaddy magazine's Jim Cusimano found the instrumentation incompetent. An influential review of the album was written by Dylan critic Michael Gray for the magazine Let It Rock. Gray argued that it transformed the cultural perception of Dylan, and that he was no longer defined as "the major artist of the sixties. Instead, Dylan has legitimized his claim to a creative prowess as vital now as then—a power not bounded by the one decade he so affected." This view was amplified by Clinton Heylin, who wrote: "Ten years after he turned the rock & roll brand of pop into rock ... [Dylan] renewed its legitimacy as a form capable of containing the work of a mature artist." In The Village Voice, Robert Christgau wrote that although the lyrics occasionally evoke romantic naiveté and bitterness, Blood on the Tracks is altogether Dylan's "most mature and assured record". 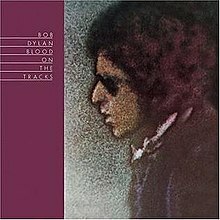 Since its initial reception, Blood on the Tracks has been viewed by critics as one of Dylan's best albums. In Salon.com, Wyman wrote: "Blood on the Tracks is his only flawless album and his best produced; the songs, each of them, are constructed in disciplined fashion. It is his kindest album and most dismayed, and seems in hindsight to have achieved a sublime balance between the logorrhea-plagued excesses of his mid-1960s output and the self-consciously simple compositions of his post-accident years." Bell, in his critical biography of Dylan, wrote that Blood on the Tracks was proof that "Dylan had won the argument over his refusal to argue about politics. In this, he began to seem prescient." Bell concluded the album "might well count as one of the best things Dylan ever did". Novelist Rick Moody called it "the truest, most honest account of a love affair from tip to stern ever put down on magnetic tape". A result of the acclaim surrounding Blood on the Tracks has been that when critics have praised one of Dylan's subsequent albums they have often described it as "his best since Blood on the Tracks". According to music journalist Rob Sheffield, Blood on the Tracks became a benchmark album for Dylan in the years that followed because it was "such a stunning comeback". Until November 2018, only one of the five New York acetate recordings that were subsequently replaced on the official album was officially released: "You're a Big Girl Now", released on 1985's Biograph. Although alternate takes of "Tangled Up in Blue", "Idiot Wind", and "If You See Her, Say Hello" from those same sessions were released on The Bootleg Series, Vol. 1–3, these were not the same takes that were initially slotted for inclusion on the official album. That collection also includes "Call Letter Blues", an outtake/early version of "Meet Me in the Morning" with alternate lyrics. "Up to Me", another outtake from these sessions, was also released on 1985's Biograph. An alternate take of the song "Shelter From the Storm" is featured in the original soundtrack album for Jerry Maguire (1996). An alternate take of "Meet Me in the Morning" was released on the B-side of the Record Store Day 2012 release of "Duquesne Whistle." "Lily, Rosemary and the Jack of Hearts" was, until 2018, the only song from the New York sessions that had not been officially released in any form. Now all of these, as well as more than 70 previously unreleased recordings, are available on the 6-disc deluxe edition of More Blood, More Tracks, volume 14 of Dylan's ongoing archival Bootleg Series. For personnel details, see Heylin, 1996 and Björner, 2014. Track numbers refer to CD and digital releases of the album. A ^ Denotes personnel performing at the Minneapolis recording sessions. B ^ Denotes personnel performing at the New York recording sessions. ^ "Shelter From The Storm – the inside story of Bob Dylan's Blood On The Tracks". Uncut Magazine. Retrieved January 20, 2015. ^ Fraser, Alan. "Blood On The Tracks 1975". www.searchingforagem.com. Retrieved July 18, 2017. ^ "Staff Lists: Top 100 Albums of the 1970s". Pitchfork. June 23, 2004. Retrieved January 11, 2013. ^ "The Rolling Stone 500 Greatest Albums of All Time". Rolling Stone. November 1, 2003. Retrieved March 22, 2007. ^ "GRAMMY Hall Of Fame". The GRAMMYs. Retrieved May 24, 2016. ^ a b Clinton Heylin (April 1, 2011). Behind the Shades: The 20th Anniversary Edition. Faber & Faber. p. 368–369. ^ a b c d e f g Williamson, Nigel (2004). The Rough Guide to Bob Dylan. London: Rough Guides. pp. 111–113. ISBN 1-84353-139-9. ^ a b c Christgau, Robert (1975). "Consumer Guide (52)". The Village Voice (January 27). New York. Retrieved September 19, 2014. ^ /music/lists/100-greatest-bob-dylan-songs-20160524 '100 Greatest Bob Dylan Songs.' Rolling Stone, 24 mei 2016. Simple Twist of Fate is ranked 15. ^ "All Things Reconsidered: The 35th Anniversary of Bob Dylan's Blood on the Tracks". PopMatters. Retrieved August 13, 2011. ^ "Blood on the Tracks - Bob Dylan - Songs, Reviews, Credits - AllMusic". AllMusic. Retrieved July 18, 2017. ^ Kot, Greg (1992). "Dylan Through The Years: Hits And Misses". Chicago Tribune (October 25). Retrieved September 19, 2014. ^ Larkin, Colin (2011). The Encyclopedia of Popular Music. Omnibus Press. p. 2006. ISBN 0-85712-595-8. ^ "Blood on the Tracks". Acclaimed Music. Retrieved January 16, 2017. ^ Jarnow, Jess (October 30, 2016). "Bob Dylan: Blood on the Tracks". Pitchfork. Retrieved October 30, 2016. ^ a b Sheffield, Rob (2004). "Bob Dylan". In Brackett, Nathan; Hoard, Christian (eds.). The New Rolling Stone Album Guide. Simon & Schuster. pp. 262, 264. ISBN 0-7432-0169-8. ^ Butler, Nick (June 26, 2006). "Bob Dylan - Blood on the Tracks". Sputnikmusic. Archived from the original on September 19, 2014. Retrieved September 19, 2014. ^ a b c Williamson 2004, p. 113. ^ "Bob Dylan". Salon.com. May 5, 2001. Retrieved May 13, 2013. ^ Rosen, Jody (August 30, 2006). "Bob Dylan's Make-Out Album". Slate. Retrieved March 22, 2007. ^ Christgau, Robert (March 1998). "Not Dead Yet". Spin. Retrieved March 22, 2007. ^ "RPM Top Albums – April 05 1975". RPM. Library and Archives Canada. Retrieved July 20, 2011. ^ "Bob Dylan – Blood on the Tracks". dutchcharts.nl. Hung Medien. Retrieved July 28, 2012. ^ "Bob Dylan – Blood on the Tracks". charts.org.nz. Hung Medien. Retrieved July 28, 2012. ^ "Bob Dylan – Blood on the Tracks". norwegiancharts.com. Hung Medien. Retrieved July 28, 2012. ^ "1975–03–01 Top 40 Official UK Albums Archive". The Official Charts Company. ^ a b Blood on the Tracks – Bob Dylan: Awards at AllMusic. Retrieved July 28, 2012. ^ "Discography Bob Dylan". irish-charts.com. Hung Medien. Retrieved July 28, 2012. ^ "Canadian album certifications – Bob Dylan – Blood on the Tracks". Music Canada. ^ "French album certifications – Bob Dylan – Blood on the tracks" (in French). Syndicat National de l'Édition Phonographique. ^ "British album certifications – Bob Dylan – Blood on the Tracks". British Phonographic Industry. Select albums in the Format field. Select Gold in the Certification field. Type Blood on the Tracks in the "Search BPI Awards" field and then press Enter. ^ "American album certifications – Bob Dylan – Blood on the Tracks". Recording Industry Association of America. If necessary, click Advanced, then click Format, then select Album, then click SEARCH. Björner, Olof (2014). "1974 Blood on the Tracks Recording Sessions". Bjorner.com. Retrieved May 13, 2014. Flanagan, Bill (1990). Written In My Soul: Candid interviews with rock's great songwriters. Omnibus Press. ISBN 0-7119-2224-1. Gill & Odegard, Andy & Kevin (2005). A Simple Twist of Fate: Bob Dylan and the Making of Blood on the Tracks. Da Capo Press. ISBN 0-306-81413-7. Hedin, Benjamin (2004). Studio A: The Bob Dylan Reader. W. W. Norton & Company. ISBN 0-393-05844-1. Heylin, Clinton (2011). Bob Dylan: Behind the Shades, 20th Anniversary Edition. Faber and Faber. ISBN 978-0-571-27240-2. Public Radio Special, "Right On Target, So Direct: Bob Dylan's BLOOD ON THE TRACKS"